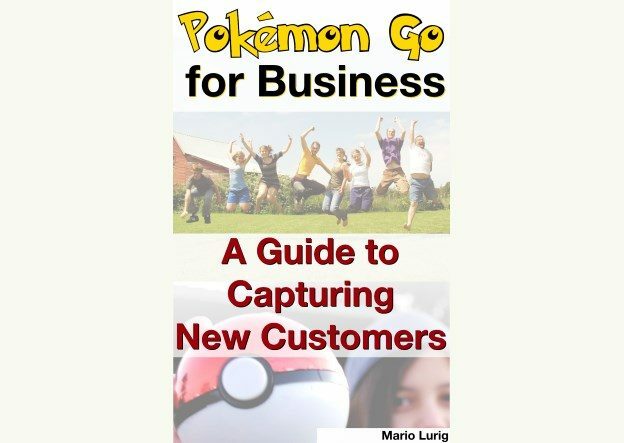 “Pokémon Go for Business” is a new ebook dedicated to helping every consumer facing business attract new customers. Well researched and full of specific, qualified ideas, the book helps explain the mobile game obsession to those who may never have heard of Pokémon before. Most importantly, it breaks down marketing ideas based on specific criteria, such as: Lure Modules, Gyms, and five distinct business types (e.g. Active Shopper, such as a retail store). Available now on Amazon sites worldwide. This entry was posted in Books and tagged e-book, marketing, Pokémon Go on August 6, 2016 by Mario Lurig. After a successful launch promotion (2000+ downloads of the novella), I wanted to talk more about book marketing. First and foremost, the version downloaded during the promotion had a special note before and after the story. The note was a personal note from me recommending a few different methods for the reader to reciprocate if they enjoyed the story. This included purchasing a copy, adding a review on Amazon or other online bookseller, and spreading the word to other fans. If the fans enjoyed the story, they will want to reciprocate, and the only way to get that message across is within the book itself. This entry was posted in Books, Marketing and tagged e-book, marketing on October 20, 2011 by Mario Lurig. This weekend I launched a new website: M&M’s Made it Better. This site was conceived over a year ago based on a simple idea: M&M’s make me happy, and their effect is likely the same for others. So, I decided to create a simple advertising campaign that allowed me to: Practice photography with a light tent, design a creative yet simple concept, and spend as little money as possible. In total, I spent ~$40 for extra supplies. This entry was posted in Marketing, Websites and tagged advertising, marketing on August 1, 2011 by Mario Lurig. If you are running a website, an e-commerce store, or any sort of business, you need an online presence in social networks. This comes as no surprise to anyone. However, besides being aware of your brand on these sites, responding to customer complaints, and reinforcing positive feedback, Twitter also allows you to reach out to new customers, one at a time. Does that sound like a lot of work? Yup. If it means you sell one more item or sign-up one more user, is it worth it? Absolutely. Every customer counts when you are starting off! This entry was posted in Marketing and tagged marketing, Twitter on June 21, 2011 by Mario Lurig. The focus here is to understand when to leverage Facebook Ads vs Google Adwords for your online advertising. While both command very large audiences, and both can also command a large Cost Per Click (CPC), the way each service approaches an audience is very different. Adwords allows you to specify keywords for your searches. While you can be broad with your searches so they compete whenever those words exist within any search query, you can also specify exact matches via surrounding the keywords in double-quotations “”. This also you to hyper-target your ads to that search audience, and also allows you to get a lower CPC price. You are competing with anyone who has ads running for either those same exact matches, or loose matches that incorporate the keywords you use. If you are fishing for some long-tail advertising (maybe as research for Search Engine Optimization tweaks), Google Adwords is the way to go. While Facebook now offers the ability to specify a ‘category’ for your audience, the primary method of limiting the results is by specifying pages or groups that individuals may ‘Like’ or be a part of, allowing you to target a t-shirt about NPR to an audience that ‘Likes’ NPR’s fan page. Sounds fantastic, right? Sure, if you are willing to pay for it. The reason is that Facebook is driven primarily by the demographic information it makes configurable in the ads you design. When advertisers are trying to entice males into a dating site, or 18-24 year olds to play a video game, they aren’t using the ‘category’ or ‘pages/groups’ limitations, and since they are use to paying a lot of money for these highly competitive advertising areas, their bids are going to blow yours out of the water. You have to match their price just to be seen, even if you are going to be more relevant to a particular user. I consider this a major flaw in the way Facebook prioritizes ads. It benefits their bottom line, not their audience. I actually believe that if they improved this methodology to focus on benefiting their users over advertisers, that a larger number of advertisers will come on-board to take advantage of these focused groups, spend less money overall, but the financial gains for Facebook will be made up in shear volume. Currently, I’m limited in the amount of Facebook advertising I do for these reasons. Do you want demographics? Go to Facebook. Do you want to target very specific words or ideas? Go to Google Adwords. This entry was posted in Marketing and tagged Adwords, Facebook, Google, marketing on June 15, 2011 by Mario Lurig. Just building the ‘next killer website’ is useless if nobody knows about it. That’s where the marketing comes in. I’ve switched gears recently to start diving back into online advertising. Previously, I had limited success spending Google’s money after given a $50 credit to test out the service. I figured, if nothing came of it, then nothing lost; it wasn’t my money. However, this time around, aside from spending $50 of Facebook’s money (more on that in another post), it was my money going towards the effort. So, it was time to get serious. This entry was posted in Marketing and tagged Adwords, Google, marketing on June 9, 2011 by Mario Lurig.